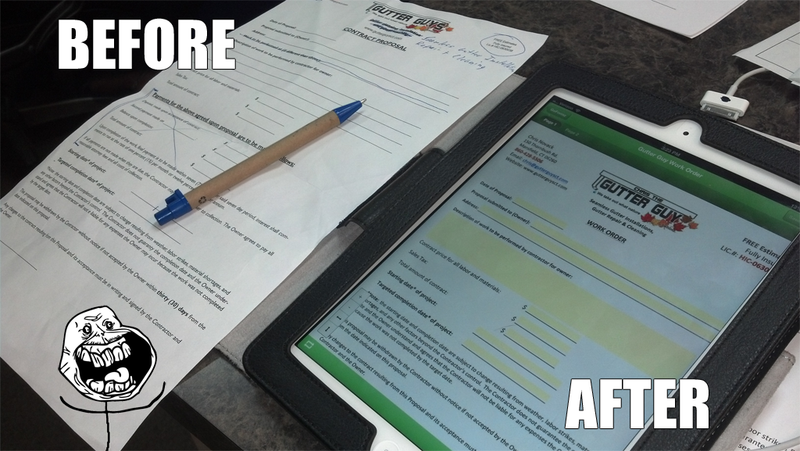 The Gutter Guy stopped in with his new Ipad 3, and demanded the following: MAKE THIS FORM PAPERLESS ON MY IPAD. I WANNA EMAIL IT, PRINT IT, AND SEARCH FOR IT LATER. Okay, no problem. A few hours later and his business can fully function directly from his Ipad. There are many options out there in terms of applications on the Ipad & Android App Stores. Some cost $, others are free. With a little research we determined which application would be a good match for Chris the Gutter Guy. There are many to choose from. Some work better than others for the particular business. With some tweaks and some setup, we took his carbon copy invoice sheets and transformed his Ipad into a mobile machine that can pump out invoices as fast as he can install gutters. He now has the ability to fill out his invoice via talking (thx siri! ), add notes via stylus, printing, emailing, searching and saving, all right from his Ipad. Contact us today analyze your business and set you up with a paperless solution for your business.